This guide shows the Shoeboxed file based integration for AccountRight Standard or Plus, version 2013 and 2014 of MYOB. This FAQ is for file / desktop based AccountRight 2013, 2014 & 2015 i.e when it's not in live mode. AccountRight Basics does not include support for Bills, and therefore cannot be used with Shoeboxed at this time. Shoeboxed’s integration with AccountRight works by assigning Shoeboxed receipts into the appropriate MYOB account code, then exporting into your MYOB as Miscellaneous Purchases. Before you start it is a good idea to remove the default Shoeboxed set categories first. MYOB Integration requires 3 steps. First, export your Chart of Accounts from AccountRight and save it locally. Then click the Add All button. Then click Export and save the MYOB (ACCOUNTS.TXT) file locally. Hence your file should start with the fields headers: Account NumberAccount NameHeaderBalanceAccount TypeLast Cheque NumberTax Code..................etc. Select "Export All" from the Receipts tab and choose "Other". 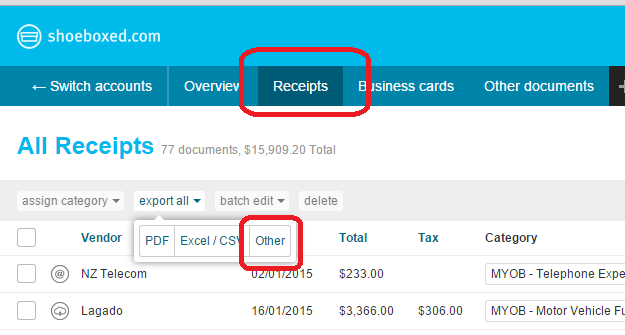 From the Shoeboxed Export Expense page, scroll down to the Import Chart of Accounts option. Choose MYOB from the drop down button, then use the Choose File button to browse to the ACCOUNT.TXT file and then click Import. Once done you will see the number of chart of account categories that are successfully imported. Go to your receipts tab and then start categorising your receipts using the MYOB chart of accounts category (you will notice that there's the word "MYOB" in front). You can use the Vendors filter to select vendors that belongs to same category and make sure that all items are displayed and select all by ticking the check box on the top left hand side and assign a particular category. Whilst you are categorising your documents you will notice a pop up box asking you if you would like to create rules for future receipts with same vendors to be allocated the same particular category. VIDEO TUTORIAL ON HOW TO SET RULES UP FOR FUTURE RECEIPTS FROM THE MANAGE CATEGORY PAGE. Select the "Export All" from your receipt tab and choose "Other". Alternatively you can select the individual receipts you want exported and select the Export Selected. Either option will take you to the "Export Expenses" page. Select MYOB to proceed. If you want to export within a date range, you can use the Date Range feature in the Export Expenses page itself. 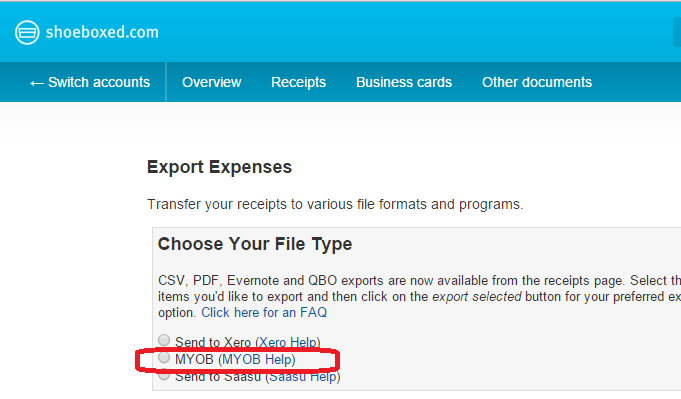 You can either use the "Send to MYOB" button but we recommend using the "Verify & send to MYOB". The verification page provides an easy way to check, recode your receipts or add any missing codes before exporting. If you click Send to MYOB, you will skip the verification stage. Otherwise, you will be taken to this screen where you can add category or modify them. During the verification process if you notice any yellow flag you can safely ignore them as they are only for information about the gst, but if there's a red flag this meas that the GST amount is more than 10%. Please use the (Calc GST) button to correct it before exporting as MYOB doesn't allow any items with GST higher than 10%. Then click the Finish Export button where your MYOB Export files (vendors.txt, receipts.txt and README.txt) will be downloaded to your computer in a Zip file. Please go ahead and unzip the file first before proceeding. Import Vendors first as AccountRight will reject any receipts from unknown vendors. Then match the Co./Last Name field to the corresponding Co./Last Name field in your account (single click the Co./Last Name under the "Import fields" then single click under "Matching Import Field") and click Import. You will then need to match the following fields up. Then Click Next and the import will happen. Check that the receipts have been successfully added: sometimes the warning is due to certain fields being empty at the time of importing (such as GST, which is not always present on a receipt).